The first Ocean's 8 trailer has arrived with a heist plan to steal from The Met Gala. The tide has turned and it's a whole new "Ocean's" when a group of 8 plan and execute the heist in New York. Hollywood has been rebooting classic movies with a female twist and, even though everyone on board isn't calling this a reboot, Warner Bros. is driving the heist series with a stacked, all-female cast. Now, after releasing a brief teaser yesterday, the studio has released the first full trailer for the movie. Can it live up to the quality of Ocean's Eleven? The talent is certainly there and that's a great place to start. As for the footage? That's for you to watch and decide for yourself. Ocean's Eight, which arrives in Summer 2018, brings in Debbie Ocean (Sandra Bullock), sister to George Clooney's Danny Ocean. The plot of this movie sees Ocean and her crew as they attempt to pull off a heist at the annual Met Gala in New York City. In order to do that, she'll have to assemble the perfect crew. Her lady gang of bandits consists of Lou (Cate Blanchett), Nine Ball (Rihanna), Amita (Mindy Kaling), Constance (Awkwafina), Rose (Helena Bonham Carter), Daphne Kluger (Anne Hathaway), and Tammy (Sarah Paulson). It's been made clear that this isn't a reboot or a remake. This is very much its own thing that will connect to Steven Soderbergh's movies. Matt Damon will cameo in the movie, providing some connective tissue to the Ocean's trilogy. James Corden is also on board as an insurance investigator. In addition, Dakota Fanning, Kim Kardashian, Kendall Jenner, Anna Wintour, Adriana Lima and Katie Holmes will have cameos in the movie. This thing is absolutely stacked. Can the movie live up to the cast they've assembled? It's a bit too early to say, but now we at least have a trailer, in addition to the recently released poster, to give us a much better idea of what to expect. Steven Soderbergh, who directed all three of the Ocean's movies, didn't return to the director's chair for Ocean's 8. He is still involved as a producer, though, which should held comfort fans of the franchise. This time around, it's Hunger Games and Seabiscuit director Gary Ross who's been tapped to bring a big heist to the big screen. Ross directs from a screenplay he co-wrote with Olivia Milch (Dude). 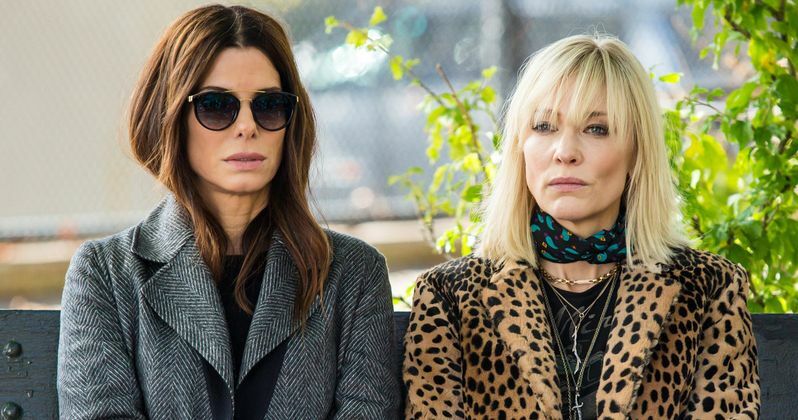 Ocean's 8 is positioned as one of the big offerings from Warner Bros. for summer 2018. The studio has given the movie a prime release date on June 8, 2018. Will that pay off? Even though not all of the Ocean's movies, specifically Ocean's Twelve, were terrific, they all made a lot of money. All told, the Ocean's trilogy brought in $1.1 billion worldwide at the box office. So if there's a way to continue the story, why not? If you do the math (Ocean's 8, Ocean's 9, Ocean's 10), there's a trilogy possibly built in here, assuming one this goes well. Be sure to check out the first trailer for Ocean's 8, courtesy of Warner Bros., for yourself below.